At the Queensday fair (April 30th) of 2008 I bought a fully working Amiga 500! When I bought it I knew little about it, except for its reputation (in relation to the scene) but that quickly changed. Upon returning home I wanted to hook it up and explore it but I quickly came to realize that I didnt have a way of hooking it up to my TV; there wasn't any cable provided for me to do so! 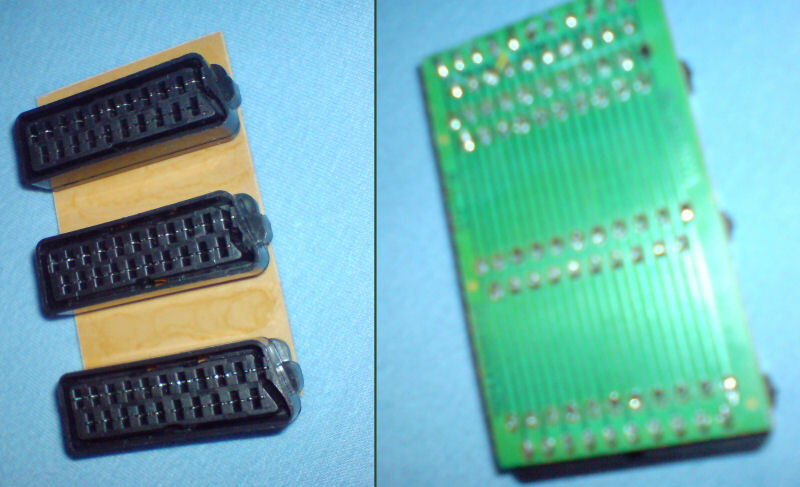 After doing some research I quickly found some pinout schemes to convert the DB-23 connector on the Amiga (which is used for video) to SCART and I decided to go with one I found on pinouts.ru (alternatively: hardwarebook.info). It was a quite interesting process as I didn't have a DB-23 connector; I did, however, have a few regular DB-25 cables (which I used in the past on a couple of ZIP drives) and I also had a multi SCART type of plug (which is a total ripoff, by the way, as the inside is just a very cheap board with elongated traces to which a few connectors are attached — the connector that is used closest to the output gets the TV's attention). Anyway, the reason I mention the multi SCART plug is that the wires that are soldered on to the board are a one-to-one match with the pins at the end of the main cable (so I basically cheated). As for the DB-25 connector, however, this was a much more troublesome affair. I began by taking one of my many DB-25 cables and sawing off the two unnecessary plugs from the female connector. After that I proceded by cutting the cable and have a look at the wiring inside but since there is no set standard in wire coloring to determine what wire goes to which pin/plug (as there is, for instance, in the RJ-45 connector of network cables), I was pretty much left standing on my own. I decided it might be worth having a look at the male connector of the cable (which I was going to discard anyway) in the assumption that the wires matched one-to-one at the female connector's side, so I took a knife and removed the plastic cable insulation from the connector only to find that the entire wiremess that I expected was fixed in a lump of glue! 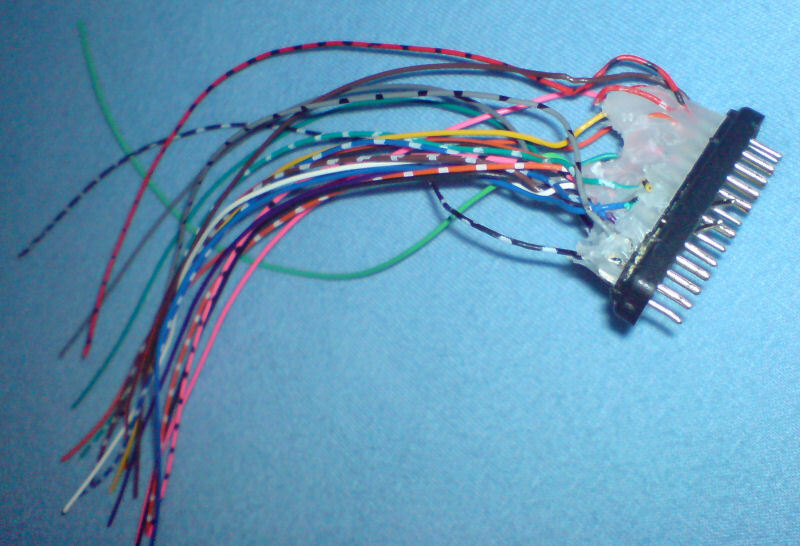 This made everything a lot more irritating for me to find out which colored wire led to which pin in the connector as, now, I had to cut through the lump of glue (and be very cautious in doing since otherwise I would run the risk of cutting a wire and lose my point of reference)! After a very long time I was able to find which wire belonged to which pin and I was subsequently able to attachs the cables and construct the finished cable. 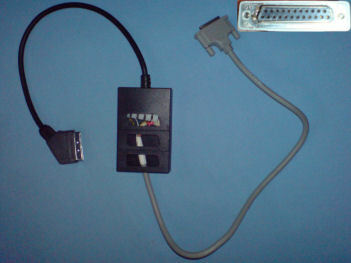 The finished DB-23 to SCART connector in an improvised encasing. After the connector was finished, I could finally begin the Amiga experience! ..or so I thought. I came to find out, as I booted up the Amiga, that this was only the first hurdle I'd overcome. As I booted up the Amiga, I was warmly greeted by the Workbench 1.3 startup screen at which it proceeded to do... nothing, which I found a bit odd as I expected to see some sort of GUI. I stared at the screen for a short while wondering if it had crashed or I was expected to push a button or something, before deciding to get some answers from the internet. After some searching and still no real answer, I went to a place I knew I could find some knowledgable people that could help me; IRC (#amiga on EFNet, to be more precise). I explained my perdicements and was explained that I needed something to boot the system off (either a boot disk/game or a hard disk, which I didn't have). What's more, the Amiga doesn't read (by todays standards) conventional floppy disks either, it needed double density floppy disks and could only read off Amiga's own filesystem format.. unless I had a later version of Workbench, which will allow it to read off FAT formatted disks.. I've since bought an Amiga hard disk (the A590) to play around with the system but right now I'm thinking about whether to install a newer version of Workbench or trying to get a hold of an Amiga 1200 (which is kind of the same thing, or so I'm told). Anyway, it's a cool system and the demo's I've seen for it (in videos) are really awesome.. can't wait to really start experiencing them on the system itself.